We have a diverse range of exceptional high-quality seafood products that we offer to leading retail and foodservice customers. From appetizers to entrees, from scallops and shrimp to natural cuts of premim fish, from fresh and commodity offerings to value-added seafood solutions, Raw Seafoods has a portfolio of seafood products that helps our partner customers to set themselves apart in the seafood category and delight their customers. Learn more about all of product options here. 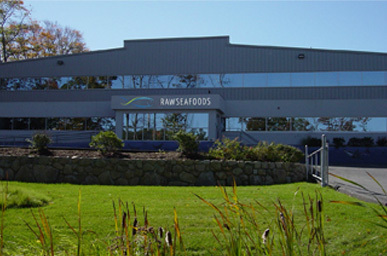 We consider every employee at Raw Seafoods to be in the quality assurance department - it's our number one focus! Seafood products entering our facility undergo rigorous inspections in every department. Products are hand graded or hand cut to provide maximum uniformity and we guarantee only the finest product available goes into each package. Before shipment all products are inspected again by our quality team, and they go through metal detection as a final step. These processes ensure that every scallop, whole fish, or fillet that leaves our plant, whether fresh or frozen, meets or exceed all of our and your standards. Responsible sourcing seafood is a core competency of ours. The Atlantic Sea Scallop fishery is considered to be one of the greatest sustainability success stories in the world and one of the best managed wild fisheries. These scallops are managed using a combined approach of effort limitation and rotating harvest areas, which maximizes scallop yields while protecting the beds of young, maturing scallops. We are proud to be a Marine Stewardship Council Certified Facility. Learn more about our efforts here. As a Charter Member of the American Scallop Association, we are now able to offer MSC Certified Scallops from the US East Coast Scallop Fishery. Third party MSC Certification means that you can expect sustainable fish stocks with minimization of environmental impacts and effective management. This certification is valid for up to five years and will be reviewed yearly to ensure compliance. We have the important capability to trace all of our products back through our supply chain to source fisheries. And traceability from products leaving our facility completes the loop. Country of Origin labeling, size, and lot numbers are jet printed on cartons or bags for full traceability on all packages. Our 80,000 square foot state of the art facility is USDA, FDA, & MSC Certified. We are also BRC "AA" certified, making us one of the few seafood suppliers of Bacon-Wrapped items and other fillet products to achieve this advanced designation. In addition, we have fully cooking capabilities for shellfish and other products, allowing us to offer Ready-to-Eat solutions. We are proud of our investments in our world-class facility, and invite all of our customers to visit us and tour our facility, it truly sets us apart and allows us to develop and manufacture consistently outstanding high-quality products for you. Each member of our team is committed to providing our customers with the highest quality fresh and frozen seafood products available in the market place. And in doing so, we provide our employees with long term, rewarding careers while building mutually beneficial partnerships with our customers. We also realize the importance of giving back to the communities that we all work and live in by giving our support to many vital, local organizations & important causes. Learn more about the work we're doing in our community to help make Fall River a better place to call home.